The 2004 Indian Ocean Tsunami began at one minute before 8:00 am on sunny and beautiful morning on December 26. The megathrust earthquake lifted the seabed and moved it sideways along a 1,600 km (1000 mile) crack in the Earth’s surface. The Indian Plate slipped beneath the Burma Plate during the 8.3 to 10 minutes that it took for the rocks to fracture along this length of the seabed. Trillions of tons of rock was moved during the event as well as huge quantities of water was displaced as the seabed shifted. The 2004 Indian Ocean Tsunami waves were created by the energy of the event that swept outward along entire length of the rupture. The maximum slippage was near Banda Aceh where the land slipped about 15 meters during this megathrust earthquake. The waves traveling at about the speed of a jet airplane swept across the Indian Ocean to eleven low lying countries where they brought death and destruction. As the waves reached shallow water they slowed up and the water piled up creating waves that were 15 meters (50 feet) high as they swept ashore. The waves swept inland in places over 2 kilometers (1.2 miles) inland. The 2004 Indian Ocean Tsunami waves that came ashore in distant lands were sometimes preceded by the ocean water receding. The receding water exposed the seafloor allowing many people to wander around taking pictures of the exposed land before the wave hit. Many children fascinated with the receding water ran out to look at stranded fish and boats on the sand. Receding water prior to a tsunami coming ashore often gives people 5 minutes to run to for higher ground. One British student vacationing in Thailand knew the warning signs from a geography lesson. She warned her family and other people in the area where they were able to get to higher land before the waves came ashore. Another India man had watched a National Geographic show on tsunamis saw the water receding. He warned his village of the danger and saved his entire village. The 2004 Indian Ocean Tsunami waves were generated by lifting or lowering of the seafloor over a large area of the ocean floor. Tsunamis are generally by powerful megathrust earthquakes where one tectonic plate slips beneath another plate. Landslides that crash into bays can create some of the largest tsunami waves in a local area. A landslide in Lituya Bay, Alaska on July 9, 1958 occurred when an 8.3 earthquake triggered a landslide that crashed into Lituya Bay. The height of the wave was 516 meters (1,720 feet) high. It was the highest megatsunami ever recorded. The largest earthquake-generated tsunami in recorded history was 33 meters (108 ft.) tall. Scientists use the moment magnitude scale (Mw) to measure very large earthquakes. They use this scale because it takes in the size as well as the magnitude of the earthquake. 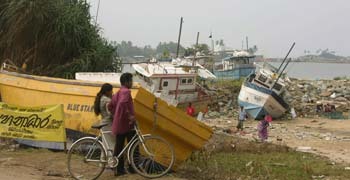 Various experts have determined the 2004 Indian Ocean Tsunami waves were generated by an earthquake that measured between 9.0 and 9.3 on the moment magnitude scale. The USGS uses the number 9.1 Mw and recent research by a Cal Tech scientist believes it should be 9.2 Mw. It was the third largest earthquake ever recorded. It released more energy that all the bombs in WWII including the two atomic bombs dropped in Japan.